Do you want to BE SEEN by fabulous moms who love to shop? 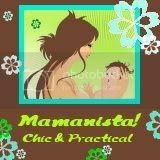 Place your ad on Mamanista! and you will be seen by thousands of chic shopping mamas! We offer advertising through BlogAds and will also place ads that run three-months or longer directly upon request (contact mamanista@gmail.com). We'll also be happy to give you some tips on the ads that have worked best on our site. Want to really get everyone excited? To gain more visibility, contact us about sponsoring a contest on Mamanista! Since we promote these contests on many different contest websites, generating traffic and buzz for you, we do ask that you take out an advertisement for the length of the contest--this way everyone wins! Contact mamanista@gmail.com to learn more about sponsoring a contest and our discounts for contest sponsors. Do you want your super cool, "Momma Gotta Have" product reviewed on Mamanista? To ensure our editorial impartiality, we have decided not to offer paid reviews, or "advertorials," on Mamanista! If you are interested in having us post about your product, we encourage you to submit a sample for review. Want even MORE WAYS TO BE SEEN? We are also members of several affiliate programs, including Share A Sale. Please let us know if you have a program you would like us to consider.